Ipsy - Monthly Glam Bag Full Of Beauty Surprises For You! I recently signed up with Ipsy, and am super hyped to share my experience with you. For those of you who aren’t familiar with Ipsy, it is a monthly beauty subscription service that provides its subscribers a Glam Bag with 4-6 deluxe samples, and full-sized beauty products for only $10/month. Since June was my first month receiving one, I eagerly waited till I received my glam bag around the 10th of the month. If you would like to get your glam bag, please click. Ipsy first determines your personal style, complexion, and skin tone based on a quick beauty quiz you take upon signing-up, which then helps them determine the products that best suit you. After that, each month they send you a different Glam Bag with new/promotional beauty products that they think you’ll try and like. Members also get huge discounts on the website for a lot of really popular beauty brands, and also get to participate in a lot of ongoing contests for beauty products at high values. June’s bag theme is ‘rebel’ which features a brightly colored make-up bag shown in the image below. Product size is really small so it’s a little hard to apply it using a bigger brush but I was still able to work with it. You can use it as a highlighter/toner/blush by using three different brushes, or just mix all the colors with one brush and apply as an overall toner to get a nice summery glow (see image below). I tried out the mask called ‘Cucumber Breeze’ already. I liked the fact that it was just easy to stick on you face because it was pre-cut in a face shape. You just glide on the mask on your face and smooth out the excess lines until it becomes even and smooth. I had to fold the top line because evidently I have a smaller face than the mask. LOL. I waited about 15-20 minutes to then just peeled-it off. No need to rinse afterwards, and you just leave the remaining paste to dry on face. Afterwards my skin felt tighter because the paste pretty much dried on my face. 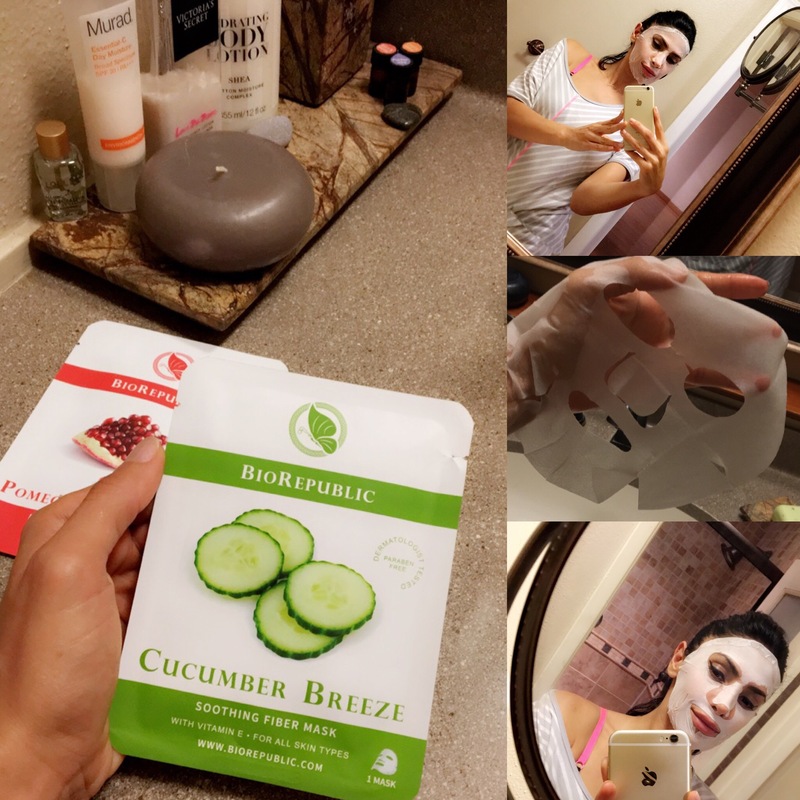 The next day my face felt a little more relaxed but the recommended use of this mask is 2-3 times a week so regular use of product may show better results over time. As far as the process it was easy, and convenient. No messy fingers like with other masks. Also something fun to do on girls night in. Lip gloss smells amazing so you smell sweet candy scent after applying it. The tone is very natural so it compliments my complexion really well (see the middle demo in the next image below). Bag has a nice pop of color and is big enough to fit all the make-up included and few other essentials of your own. Perfect for summer pool or beach gatherings. Applied all the products together in the images below. Took photos indoors and outdoors so you’ll notice tone differences. These days we we all have enough make-up to last us a while but I certainly enjoyed the anticipation of getting this bag. Mainly because I didn’t know what was in it. Get your own bag by clicking —> MyIpsyBag and have fun with it! For only $10 a month I think this subscription is totally worth it because you get to sample a variety of different products that are pretty big sizes, and the ones you really like you can purchase later. You practically get a lot of products for the price of lunch for one day. Best part is you get to discover new beauty essentials specially for your complection without having to walk into a store. l have to also add that they did a great job of selecting products that match my complexion. Next articleGreetings from Jamaca! YAMAN! ?? ?